Document workflows involving an approval process (a signature, comment, review or some combination) are a very common use case for our customers. In this series of articles, I’ll illustrate several design patterns and show you how to automate the workflow. This first approval process starts with an internal employee requesting something from someone outside your organization. The external person fills in and signs one or more online forms without needing to login/authenticate. The completed documents then come back to the same or another internal employee for further processing. Collect one or more signatures on documents (purchase order, lease …). Request a quote from a supplier or vendor. Obtain a reference for a job application. With frevvo 5.3, automating this process is trivial. 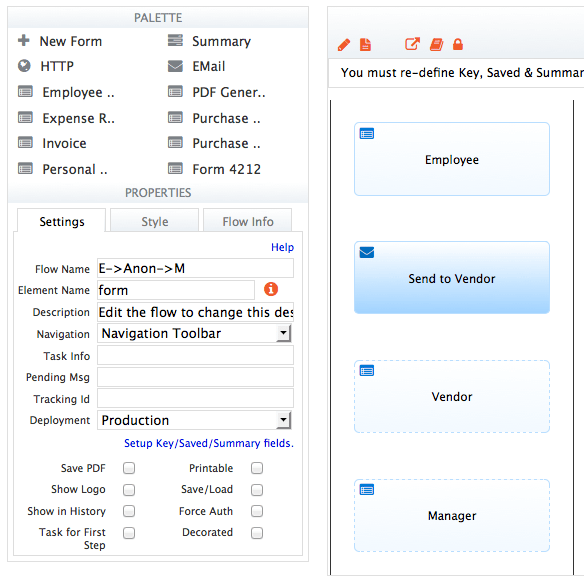 Drag and drop the internal employee form(s) into the workflow and use the Form Designer to layout/arrange controls. Drop in a separate form (or use a linked activity) for the anonymous external person and add desired controls e.g. a signature. Make sure this step has no role or user assigned to it. Drop an Email activity in between. Configure the email address. Typically, you’d use a template so the email address of the recipient is entered by the internal employee. You probably want to customize the default email message as well. Drop in forms (or another linked activity) for the subsequent processing step by an internal employee. Make sure you either assign a role or a user to this step. For example, if you want the workflow to return to the originating person, you can use a template that’s automatically populated with that person’s user id. That’s it. How does it work? Say, you’re requesting a quote from a vendor. The employee starts the process, enters the vendor’s email address and other information and clicks the Send button. 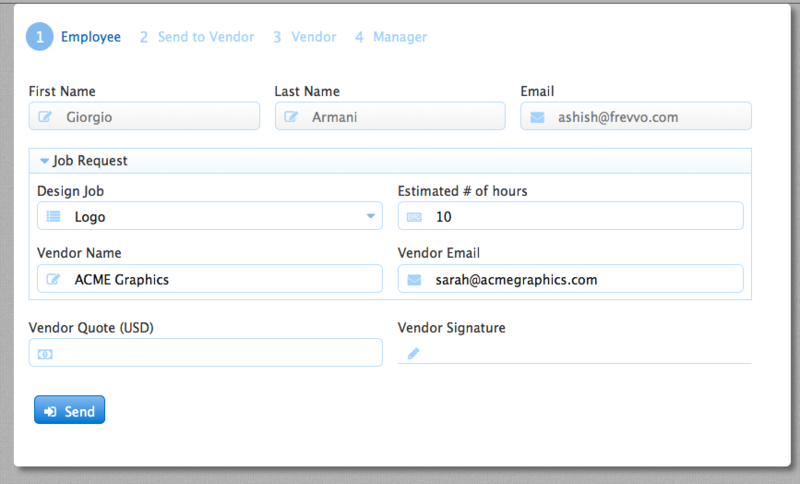 frevvo will send your customized email to the vendor with a unique URL. 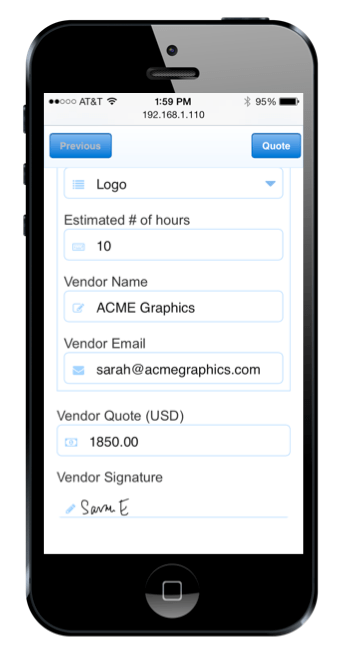 The vendor can click the URL and fill in the quote and sign it. Upon completion, he/she clicks the Continue button and the workflow returns to the originating employee. Vendor’s on the road using a smart phone or tablet? No worries – just click the link in your email and it’ll automatically render a mobile version. Previous Post How do I use my frevvo forms and workflows on mobile devices?